Wallpaper sample books are one of the lesser known areas of the Wallcoverings department. While sample books can vary greatly in quality and size, each has a story to tell, offering insights into period color trends and wall treatments. The earliest surviving American sample book was produced by the Janes & Bolles Company, in business from 1822-28, but sample books weren’t produced in any volume until about 1900. A case in point is the star of today’s blog, a design that appears to be a striped wallpaper. This is one page from a sample book produced by the French firm J. Grantil in 1929. The Grantil company was founded in 1838 and is still printing wallpaper today. And given the stylish designs they created for an affordable price, it’s no wonder they thrived. Adhered to the bottom of this sample is a color lithograph showing the intended use of this paper, though without this guide not many people today would have a clue how this paper was intended to be used. This striped design was to be cut apart to serve as two different borders creating a paneled effect. The wall treatment as illustrated would require four different wallpapers, three of which are contained in the museum collection. Interesting to note, the once metallic gold color, clearly seen in the print, has now oxidized and turned green. The large bouquet of hydrangea, along with the hydrangea-striped wallpaper used on the inset panels, give some relief to the bubble gum pink background. 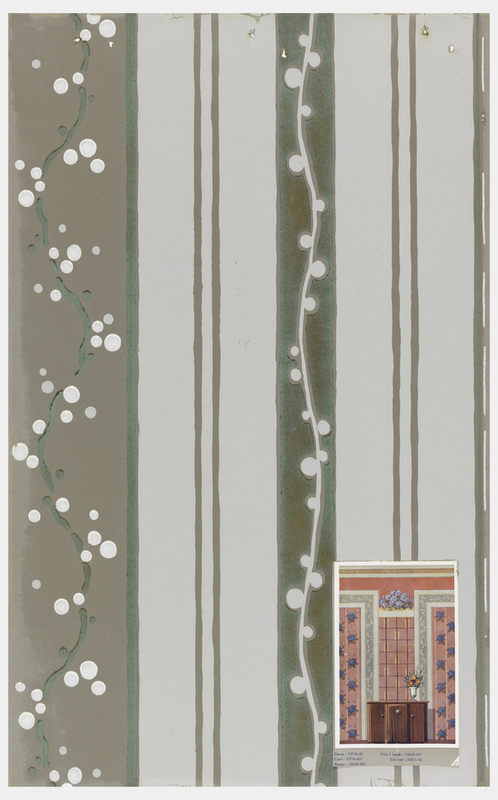 The trellis paper included in the book is in a second colorway, indicating this wall treatment was available in different color options. The museum sample is printed in reverse of the paper shown in the illustration. This wall treatment as shown creates a strong and elegant interior, while the variety of different patterns and strong colors used would prevent this from becoming boring. But you’ve gotta’ love pink!